If you are already a ringer and have moved into the area or are visiting the town, you will be made very welcome! Occasionally our Tuesday evenings consist mainly of learners’ sessions, so it might be best to check first via the contact details below. If the main church door is locked, please come to the door in the north transept, following the path round to the right from the main south door, and press the intercom button to speak to one of the ringers to gain access. (You may have to pick your way carefully over the grass and round the tombstones if part of the path is still blocked off because of unstable stonework on the roof.) The main door will of course be open for Sunday morning ringing. If you are interested in learning to ring, are reasonably fit, and able to climb the many steps to the ringing chamber, we would love to hear from you. You do not need to be musical, but a sense of rhythm helps. It does take quite a while to learn to handle a bell safely before you can join in with the rest of the ringers, so it’s best not to expect instant success. As with many activities, the youngsters tend to learn at a faster rate but we like to have a mix of ages, so even if you are not in the first flush of youth, do come and see if you’d like to have a go. When someone can handle a bell reasonably well, we will invite them to join us for ringing on Sunday morning whenever they are available. We don’t just ring for Sunday services; there are also weddings, civic occasions, carol services, and important national occasions to ring for. And sometimes we arrange special ringing for fun and to set ourselves a new challenge. We also ring in other towers, and get to know ringers from around the local area and further afield. When you’re a ringer, you are part of a much wider community and you will generally be made welcome wherever you go to ring in the UK – and a number of overseas towers too. We have eight bells hung for ringing in our tower: the heaviest (known as the tenor) weighs just over 21 cwt or 1,067 kg. The lightest is called the treble and weighs just over 6 cwt or 305 kg. There were six bells originally, but in 1773 the six were exchanged for a ring of eight, using the metal from the old bells. By the middle of the 19th century the tower had become unsafe and when the church was heavily restored, the Victorian architect Sir George Gilbert Scott removed the ringing room floor as part of his re-design and for over a hundred years the bells were not able to be rung. They were merely chimed by means of a chiming mechanism high up in the tower. However, and happily for us, the ringing room floor was replaced in the early 1980s, the bells were re-hung in a new frame and they have been rung regularly ever since. We now have a team of ringers, some more experienced and some just learning, ranging in age from 13 to 70-something. 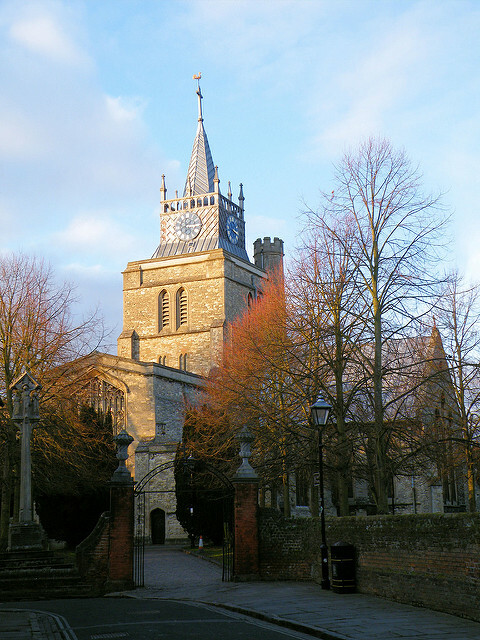 We ring as a service to the church – we are an audible reminder that an act of worship is about to take place – and because bell ringing is a fascinating and challenging hobby requiring physical and mental co-ordination, and a lot of team-work.